After having some good success with my Eggless Chocolate Bundt Cake, I wanted to try applying the same technique to other recipes. The cake had such a moist, soft, light texture that it is now one of my favorites. The best part is that no one ever suspects that it is different tha other chocolate cakes, only that it tastes really good. I decided to apply the same vinegar instead of egg technique to muffins. I was hoping to achieve something light and high rising, in addition to being tasty. Muffins are often heavier an dense than other kinds of cake. There isn’t anything wrong with that, though. In fact, it can be quite delicious, but a lighter muffin is a nice change. The substitution worked out perfectly. The muffins were light and delicious. I love using pumpkin in muffins because it makes them very moist, much like using applesauce. 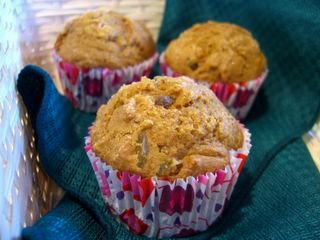 These muffins were much dense than some typical muffins, perfect for afternoon snacking in addition to breakfast. These travel well, but should be stored in a airtight container if you are not going to eat them all in a day or two. They also freeze quite well. If you use chocolate chips instead of raisins in the muffins, you could even have these as a light dessert. Preheat oven to 375F and line 12 muffin cups with paper liners. In a large bowl, whisk together flour, baking soda, baking powder, salt, pumpkin pie spice and sugar. In a medium bowl, whisk together melted butter, milk, pumpkin puree, vanilla extract and apple cider vinegar. Add wet ingredients to flour mixture and stir until almost combined. Quickly stir in raisins (or chocolate chips) and spoon evenly into prepared muffin tin. Bake for about 15 minutes at 375, or until tester comes out clean. Remove from tin to cool on a wire rack. Nic – these are just my speed… I really love pumpkin muffins, but they’re usually loaded with fat. I was shocked to see that yours only have two tablespoons of butter – especially since they have no egg! These would be so good with a nice cup of Chai. These look excellent and I simply must make them. Thank you for sharing the recipe. i’ve always wanted to try baking something with pumpkins. yours look really delicious, and simple. i must try my hand at making these! Cathy – I know! I think it’s the pumpkin that makes them work so well. And I’m not about to complain about a healthier muffin. Annymous – No, these will not work in the same way with only baking powder. The leaving is primarily provided by the reaction between baking soda and vinegar. I am sure that baking soda is available in Japan, but it is possible that you might have to look at a specialty grocery if it isn’t available at your regular store. pumpkin is one of the best things to spice up. These sound like such an interesting idea, though it make take me a little while to try them. So…what’s the basic formula for veganizing a cake? 1 1/2 vinegar and 1 t baking soda for every egg? Jessica – Unfortunately, I don’t think that there is a basic formula. In this recipe, the vinegar and the baking soda act as leavening, not as an egg replacer. Eggs play more of a role than just leavening, helping to bind ingredients together and adding a lot texturally to cake or muffins. You’ll just have to experiment and see what works best for you! your site is awesome! i ran into it through someone else’s site. i hope you don’t mind that i use this recipe. the picture alone is making me drool. looks delicious! I am probably going to try these tomorrow or Sunday. Great job!